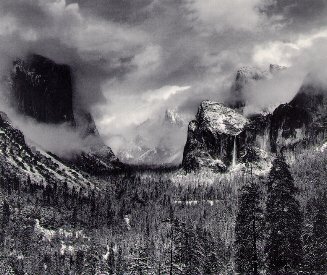 If there is one photographer known widely to the general public it is Ansel Adams (1902-1984), whose photographs of the western United States landscape, particularly those of the magnificent Yosemite Valley, have been etched into the consciousness of several generations. But, as with many great artists, his work has perhaps been overexposed, reaching that condition where familiarity tends to dilute its impact. And, too, at a time when taste in art runs to edgier styles and urban angst, rather than to more traditional landscape or (dare it be said?) spiritual content, Adams’ work is ripe for reassessment. For the occasion of the centenary of Adams’ birth, the San Francisco Museum of Modern Art has organized a major exhibition of some 100 of Adams’ finest photographs, curated by John Szarkowsi. In this first major survey of Adams’ work since his death, Szarkowsi expresses particular interest in Adams as a modernist and in Adams’ creative process, particularly his passion for quality in the printing. For if, in its early years, photography was treated as reportage, as something less than art, it is surely clear, in retrospect, that no two photographers will see in quite the same way, that choices are made both behind the camera and in the darkroom; Adams was one of those pioneers, without a master to guide his way, who practiced photography as art. Szarkowsi says that Adams’ photographs "demonstrate that even in the great theatrical diorama of Yosemite the mountains are no more miraculous than a few blades of grass floating on good water. His pictures enlarged our visceral knowledge of things we do not understand." It is things felt but not understood, of course, that often lead to those "spiritual" feelings (a word Szarkowski says Adams would have abjured). That Adams felt, and his work expresses, a deep emotional contact with the natural world is clear; label it what you will. A room of works from the 1920’sby other artists shows the context in which Adams began his artistic quest. A stunning Imogen Cunningham photograph, a closeup of a magnolia blossom, seems as fresh as tomorrow and instantly conveys joy in the perception of the natural beauty of the flower. A small Georgia O’Keeffe oil of Lake George captures the essence of the landscape with a few horizontal bands in cool blues and greens–squint just a bit and you have a minimalist abstraction. Szarkowsi has chosen some Adams photographs for the exhibit that are instantly familiar–if not specifically, then stylistically and in terms of subject matter. Sweeping landscapes with craggy peaks, storms, trees in all seasons. These reaffirm Adams’ mastery of light and shade and composition. But Szarkowski wants to emphasize lesser seen aspects of Adams’ work. If the broad landscapes constitute a macrocosmic view, there are, too, images of nature in microcosmic form–those blades of grass mentioned above. "Grass and Water" (1935) has thin reeds of grass forming angled patterns of white line against the darker background of the water, with clouds and the gleam of the sun reflected back from the surface of the water as well. It’s a technically wondrous photograph and, yes, a modernist abstraction as well. Adams may not have used that terminology, but the vision that produced the art is consistent with such a point of view. When the sun is gone, the same subject, in "Grass and Pool," becomes even more simplified, pure patterns of light line against dark background. Szarkowski offers several groupings of other smaller scale subjects–rocks, dead trees and stumps, wood details, leaves, waves, geysers. Adams finds the unexpected patterns, the chance plays of light and shadow, a pervading sense of the mysterious, of the uniqueness of each bit of the natural world. Among the other works on view, "Wanda Lake" is an astonishing landscape of highly patterned snowy ridges reflected in water so still and clear that it creates a mirror image and the entire composition emerges as a Rorschachian pattern on the horizontal axis. "Lake and Cliffs" is laden with natural drama, the rock of the cliffs thrusting upward as it must have when these mountains were formed from the surging uplift of seismic action–it could be a setting for the Wagner Ring, where the fates of humans and the gods intermingle. A personal favorite is towards the end, "Aspens" photographed in New Mexico in 1958. A sapling blooming in the foreground catches the light, while the tall verticals of the forest are dimmer as they recede into the background. Two prints are shown, one made near the time the photo was taken, the other from Adams later period when he was reprinting negatives and heightening contrasts for a more dramatic effect. The purists are scornful of the later works, considering them compromised. To this viewer, both are astonishingly beautiful, each creating a somewhat different effect, each a different aspect of the artist’s perception. Adams’ remarkable body of work stands as surpassing artistic accomplishment in and of itself; it also helps the world to see the ever-changing glories of the pristine natural environment which he championed with passion.